The newest Goldtouch Mobile Bundle combines three of our favorite travel accessories: The Go!2 Bluetooth Mobile Keyboard, The Bluetooth Comfort Mouse, and The Go! Travel Laptop & iPad Stand. This package combines the best in desktop ergonomics with the convenience of lightweight travel accessories. Stop straining to see your mobile devices: By placing your laptop or tablet on the Go! Travel Laptop & iPad Stand, you can instantly bring your screen up to eye level and get rid of that “hunched over” feeling. Travel doesn’t have to mean tiny: The Goldtouch Go!2 Mobile Keyboard is a travel keyboard that doesn’t feel like a travel keyboard. 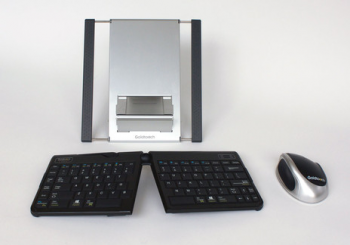 This full sized mobile keyboard is silent, fast and responsive. The sleek and slim Goldtouch Go!2 Mobile Keyboard is the perfect work and travel companion for the on-the-go professional. This lightweight product features full sized keys that are fast and responsive, ensuring productive, regardless of venue. Isn’t that what a keyboard is meant to do? Mobile comfort: Unlike other travel keyboards, which sacrifice comfort for convenience, the Goldtouch Go!2 mobile keyboards features full-sized keys. Adjusts to fit you: Adjust the keyboard from 0º to 30º’s to find the position that feels just right, and optimize your personal comfort. Slim and lightweight: When you’re ready to go, you can fold this mobile keyboard in half and slip it right into your carry-on. Designed to mirror your hand in a weightless environment, the unique shape of this ergonomic mouse will ensure you keep your wrist at a natural 24 degree angle to alleviate pressure on tendons and joints. More comfort than ever before: An oversized thumb cushion will help you grip the mouse without overstretching, no matter what size your fingers are. Bluetooth technology: Just pair the mouse with your Mac or PC and you’ll be ready to go, wherever you are. Lightweight and portable: With a slim profile and weighing only a single pound, the Go! Travel Laptop Stand goes wherever you do. Included is a soft neoprene case that can double as a mouse pad when you’re working on the road. Features 1000 DPI optical resolution.